Divorcing your mortgage can be a tricky process. 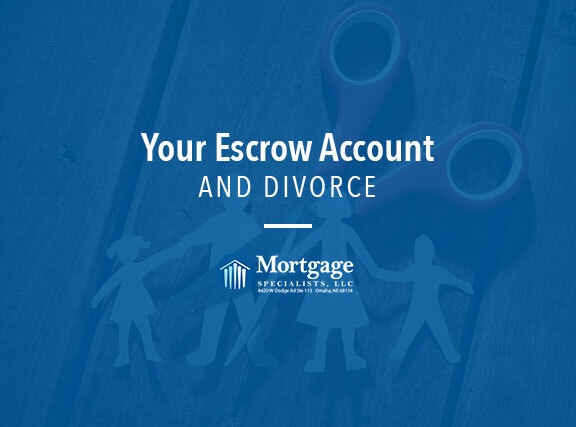 One of the most common questions we’ve received recently is about the escrow account and divorce – what happens to the money in the escrow account? Before we breach that issue, let’s review a few things about divorcing your mortgage. To be free of any and all liability to the mortgage, you have to be released from your financing, which is most commonly achieved through refinancing, payoff, or sale. Unfortunately, it’s more complicated than handing over the keys and relinquishing your payment responsibilities and deeded rights. After your mortgage is refinanced or paid off through the sale of the home, the remaining escrow balance will be refunded. This refund check is distributed after closing and is made payable to whoever is listed on the mortgage, meaning it could be made out to you and your ex-spouse. Because the refund check is often made out to both parties, we recommend the divorce agreement specify how the refund check will be dispersed. Doing so will bring the parties to an agreement prior to receiving the check and hopefully help garner everyone’s participation in endorsing and cashing the check. It is important to note that while you can view your escrow balance on your monthly mortgage statements, the exact amount will likely change. So, use percentages instead of numbers to allocate the remaining escrow balance. If you’re the party staying in the home following a refinance, you’ll need to figure out how much money is needed for your escrow account. The amount needed varies based on the timing of property tax and homeowners insurance payments. As you can see, there are quite a few things to consider in regards to your escrow account and divorce. If you are getting divorced, we’d love to help you navigate the process of divorcing your mortgage.